This is for modification for sites created after November 2014. For changing styles in the previous version, click here. This can be done through the 'Manage Styles' section of the dropdown menu on your site! Click Live Site in the top bar, and choose Manage Styles from that dropdown. This will bring up the customization overlay for your site. 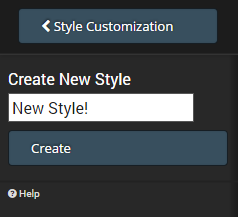 You will be able to see your current Active Style, any other styles you may have created, and the option to Create New Style. Click the Create New Style button to continue. From here, you'll need to name the new style and click the Create button on the left column.